Even healthy smiles don’t always look that way to the untrained eye. Stains, cracks, gaps between teeth, and other imperfections can take their toll on your self-confidence over time, leaving some patients unwilling to smile, speak, or laugh without fear of embarrassment. Dr. Mitchell can help you overcome this problem and achieve the beautiful, healthy smile you need and want – that’s why our team offers cosmetic dentistry services in Fayetteville and East Point. Please contact either location today to schedule your first consultation, or if you have any questions! Unfortunately, cosmetic flaws aren’t always limited to a small spot of discoloration or a minor crack – there can be many imperfections, leaving patients overwhelmed about what course of treatment to take and the overall cost of multiple procedures. 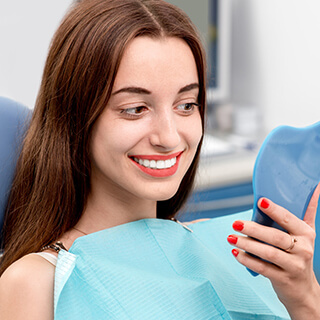 In these cases, our team may recommend porcelain veneers as a comprehensive and high-quality cosmetic solution that can revitalize your appearance in as little as two appointments. 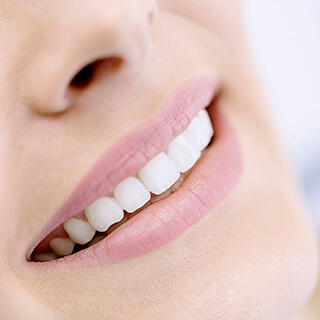 By definition, veneers are extremely thin shells of lifelike dental porcelain that are constructed to fit over the front surfaces of natural teeth instead of the entire structure. By doing so, they hide various dental flaws (chips, discoloration, misshapen teeth, even minor gaps) beautifully while the natural teeth stay safe underneath. Dental porcelain and ceramics are resistant to discoloration, which means your new veneer will maintain its brilliance in a way that exceeds your expectations. Teeth discoloration/staining can happen over time for a number of reasons, including consuming foods and drinks like coffee and tea, old age, and even the use of certain medications. Thankfully, they don’t have to stay that way. Instead of reaching for an over-the-counter whitening product, talk to Dr. Mitchell about having a custom-made kit put together at our office. These kits feature professional-grade whitening gel and personalized oral trays that can be worn on your own schedule in the comfort of your own home. Within a few weeks, your enamel should appear several shades brighter!